Ali (now 5 years old) thinks the local Halfords auto-parts ‘specialist‘ is a bit of an idiot. He’s not wrong…. Mind you, when it comes to cars, Alex is a total sponge for information (as mentioned in previous blog entries). He is very curious as to how things work, so when I had to swap the old ignition coil out and replace the leads he wanted to help. One explanation to Alex as to how the ignition system works and we then drove off to get the parts. We visited a couple of places to get prices for parts before buying anything. The first place we visited was Camberley Auto Factors, who are usually pretty good at understanding parts and cars, although sometimes they need a hand, but all in all, they know their general stuff. Generally Halfords (from my experience) is now staffed by people who couldn’t get into the fast food business because they didn’t have the required qualifications…. (Now and then you can get lucky and find a helpful member of staff… but they generally get better jobs and leave Halfords very quickly). 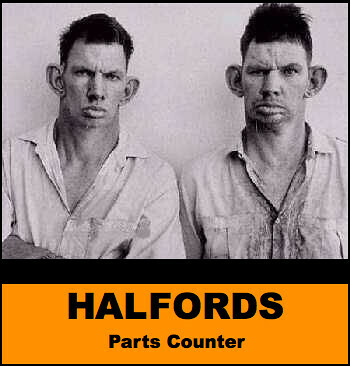 We got the prices from Camberley Auto Factors with no problem, then went to Halfords as a comparison. Parts Specialists…? I should have known I was on to a loser with them, especially as last time I asked for a Series 3 Land Rover part, they responded with “Is that the Defender Rover or the Discovery Rover?“…. 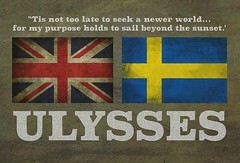 No, you arse-hats, it’s a SERIES 3…. just like I JUST SAID IT WAS!!! So we went back to Camberley Auto Factors and picked up what we needed. Once we got home I put all the new parts in place with Ali’s help (and lots of questions about how THIS bit works, and WHY does THIS bit do THIS?). 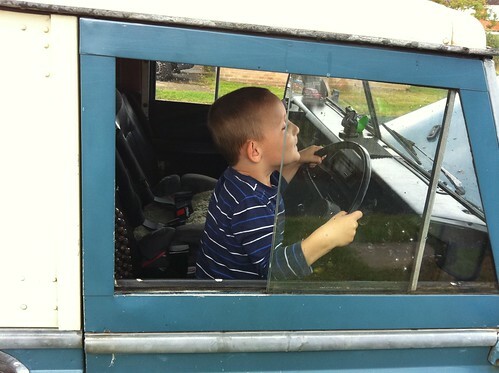 Next I needed to do a bit of tinkering with timing, so Alex ran around to the drivers seat and awaited my instructions…. Worried about safety? Well, he knows to check the car is in neutral before starting up…. but to be on the safe side I had selected neutral on the diff’ too, just in case he accidentally selected a drive gear (this way the car was never going to move with him in it). Ali started the engine up when I asked him, adjusted the choke and gave the engine some throttle when I asked for it. Yes, I could have done it on my own, but he wanted to help, and he made things easier for me. Timing is nicely set now with the new coil and HT leads working well.